Aves? Aves is Aves® Studio. The manufacturer of some of the finest sculpting and taxidermy materials on the planet. They make a variety of clay, and mache’s. You will not find a better variety of material to work with. These blogged articles are going to be dedicated to Aves® Apoxie® Sculpt, and its properties. I have been using Aves® Apoxie® Sculpt for about 8 years now, and I think it is by far and away the best all around sculpting medium I’ve ever used. 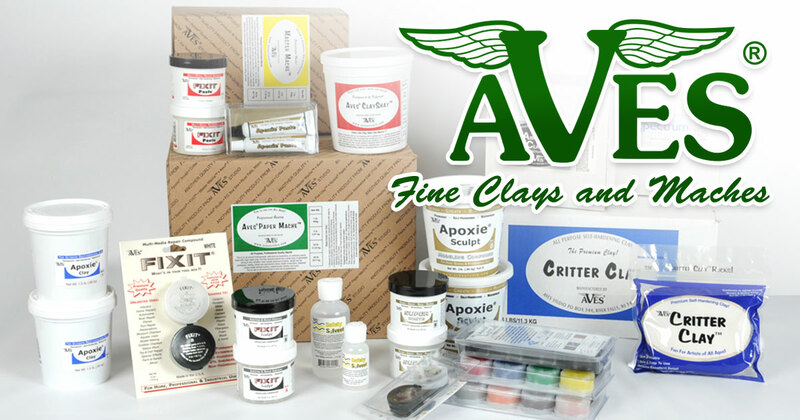 Other media, such as wet clays, polymer clays, oil based clays, and waxes all have their place in the spectrum of clay sculpting, but when it comes right down to it, if you want a permanent medium, that will never fall apart, break, or degrade, then Aves® Apoxie® Sculpt is the medium for you. What Is Aves® Apoxie® Sculpt? 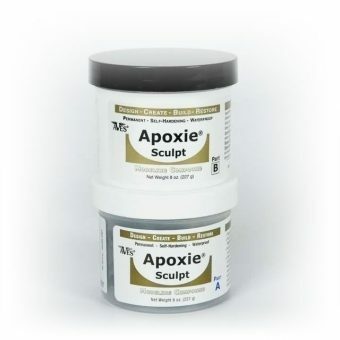 Apoxie® Sculpt, is a two part modeling compound that when mixed properly, will remain pliable for about 3 hours, allowing you to sculpt and work it into shape. It is user friendly, safe and easy to use. No nasty fumes and non-hazardous, it is ideal for those who work with it at home or in a studio setting. There is a part A and a Part B. It comes in many colors, but my personal favorites are natural, black, orange, red, and bronze. Each of these seems to have its own advantages and textures that I quite enjoy working with. The Natural colored Apoxie® Sculpt seems to be a good, all around medium that allows you to create high detail, without the pieces turning out muddy looking. When I say muddy, I mean, that the detail is not crisp at all, and is soft looking. I prefer the red or the orange for certain things such as large smooth areas. I use these two colors primarily for sculptures that have to have that machined look. Glass smooth surfaces, and ultra clean lines. The reason why I like these two colors the best is that when you smooth down the surfaces any imperfections are blatantly obvious. They stand out allowing you to see them well before the material has cured. Black is a medium in all of itself, because it has the incredible ability to bond pieces together. I’m not sure if it’s the pigment used or if it somehow makes a covalent bond on a molecular level when joining pieces together but I can say that it is my favorite media for joining materials together that I don’t want to come apart. I bonded glass to metal while the pieces were underwater and it cured solid as a rock! The Bronze colored Apoxie®, is probably one of the nicest media when it comes to turning out pieces that have that nice rich bronze color. They use real bronze powder I believe and it really shows. I love it for bonding sculptures together for the simple fact that like the black, it is exceptionally tacky when first mixed and it has fantastic adhesion properties. What Kind Of Sculptor Am I? This has nothing to do with what you want to sculpt; but what kind of habits do you have in your studio? I personally am a lazy sculptor. I work until I either reach a stopping point, or the material ceases to be malleable and put my tools off to the side and forget about them. By doing so you end up with a lot of dried Apoxie® Sculpt on your tools and it is nearly impossible to remove without some kind of cutting medium which is why I stick with Metal Tools primarily. 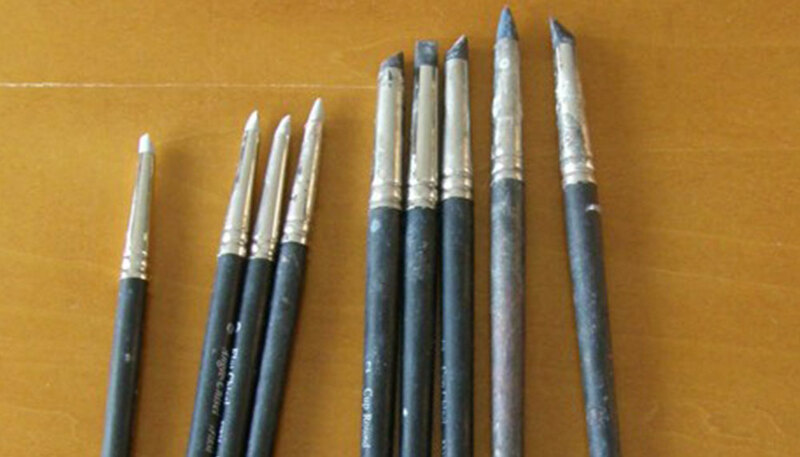 Even rubber tipped tools can become coated with Apoxie® Sculpt, causing them to wear down. Wooden Tools, are great, if they are disposable, or something you made for yourself. I have found that wooden tools are susceptible to the Aves® Safety Solvent and can take the finish off of the tools with excessive exposure and also cause the tools to crack (as with water), and eventually fatigue. 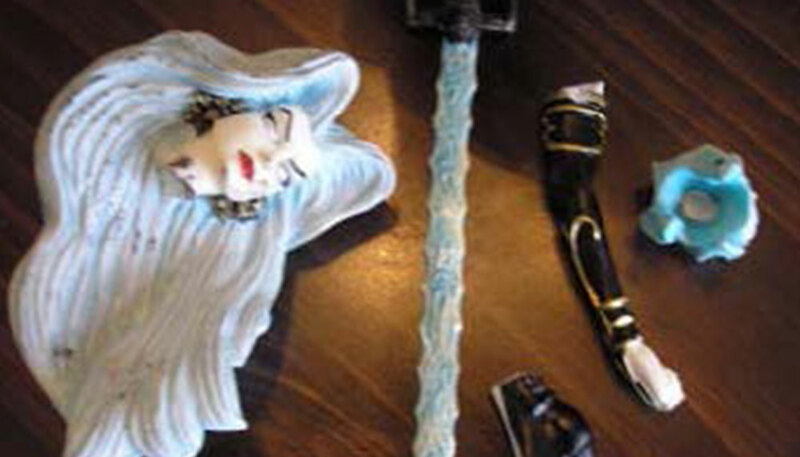 Plastic tools with prolonged exposure to safety solvent also fatigue and essentially melt over time. Now, I’ve used plastic tools with Super Sculpey and had the same thing happen so in essence some of these plastic tools that are mass produced are made of junky recycled plastic anyway and should be considered disposable regardless. I am of the mind that if you’re going to sculpt even as a hobby that metal tools are the best way to go because I’d rather have a set of tools that I know, am familiar with and can use for decades, than have something I’m consistently changing out and trying to re-learn. 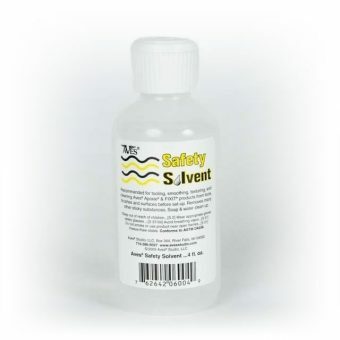 What Is Aves® Safety Solvent? I use it in conjunction with my tools, and it makes the tool slide over the material so much easier without dragging. I prefer it to water, or any other media. I would highly recommend that if you work with it, you work on a surface that you have no problems getting it on. Preferably formica, or some kind of laminate surface. Do not use it near finished wood. It’s called Solvent for a reason. How Much Working Time Do I Have? On average, in a room at 72 degrees, you have approximately 3 hours. Now that varies according to temperature and of course humidity. I have had Apoxie® Sculpt cure on me in as little as an hour, and I’ve had it languish for up to 6 due to the temperature. There’s also mass to consider. The thicker the application, the faster it will cure. If you’re making a big ball of it, you can expect that ball to harden in about an hour, and be hard as a rock in 3 hours. I prefer to use some kind of inert filler, such as floral foam, or aluminum foil and apply it in layers going from the rough stage, to a finished stage, and it saves me a lot of material. How Long Will My Sculpture Last? Any medium can be messy. 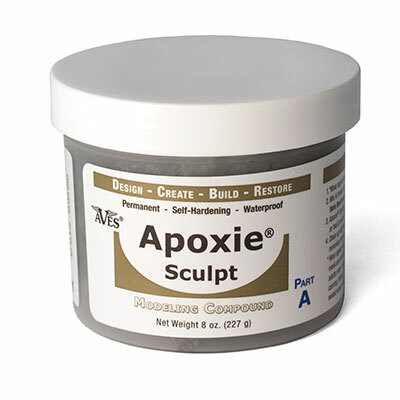 I would set aside a work table and area to work with Apoxie® Sculpt that you would have no problems getting messy. Apoxie® Sculpt is a PERMANENT medium. When I say Permanent, I mean PERMANENT. If you get it on your carpet, your floor, wall, or on your clothing, it’s going to be permanent if you do not address it quickly. If you sand, or machine Apoxie® Sculpt, use you brain and Wear A Mask. Like any other medium, when you sand it or machine it, it kicks up dust. The difference between Apoxie® Sculpt dust and regular dust is that Apoxie® Sculpt dust can stick and bond to your clothing if its not 100% cured (24 hours). Other wise make sure you use a good detergent! From time to time we all make a mistake or two. If you get Apoxie® Sculpt on your carpet do not panic. There are a couple ways to deal with Apoxie® Sculpt on carpet. 1. If the Apoxie® Sculpt is cured, but not ground in, it should pull up nicely, as most carpets are inorganic and the fibers should pull free with a little work. 2. If the Apoxie® Sculpt is Not-Cured, and gets ground into the carpet, do the following. A. Peel up as much of the Apoxie® Sculpt as you can using a comb, or a metal pet brush. I have a cutter comb for cats that I use specifically for THESE kinds of accidents. If you can get 80 percent of it up, you’re doing great. Then go rent a carpet cleaner, and get that stuff up out of your carpet as quickly as possible. You will have about an hour to achieve this. If you cannot get a carpet cleaner, proceed to B. B. After you’ve gotten most of the material up off the carpet, get a coarse scrub bursh, and your safety solvent. Sparingly, use the solvent to get the remainder out of your carpet fiber. The Scubbing of the brush should lift the Apoxie® to the surface, then wipe with a damp towel. If you’ve got nice supple fibers in your carpet again, then you’ve gotten the job done. If it’s sticky, tacky, or rubbery feeling, wait 24 hours before proceeding to C.
C. If you’ve gotten nearly all of it out of the carpet, but have a patch of carpet that’s stiff or unforgiving, take a rubber mallet, and beat the area lightly crushing the Cured Apoxie® into powder, then vacuum. You can also use that Pet Comb I was telling you about to rake out any and all particulates out of the carpet. It should come up with a little work. D. If you’re using Colored Apoxie® Sculpt, such as red, black, orange etc, immediately get a rug cleaner. You’re not going to have any luck getting that stuff out of your carpet. Hard Wood Floors. If you get some of this on your hard wood floor, Depending on how recently you’ve waxed your floors, it should pop off if you can get under it with one of your sculpting tools. If you use your Flexible metal spatula, you should be able to pop it loose. Wooden Furniture, is the same. However, DO NOT USE SAFETY SOLVENT. Aves® Safety Solvent on hard wood floors, or wooden furniture can be deleterious to their finish if not wiped up right way. For your clothing, Tide with bleach seems to work the best. It’ll remove dust and particulates in the cold cycle. Do not use hot water on clothing that have been covered in Apoxie® Sculpt dust. For your carpet. Aves® Safety Solvent, or Spot Shot. Spot Shot seems to do a great job getting it out of your carpet. For your tools. Aves® Safety Solvent, and or steel wool. For your work area, Windex Food Service Formula. build up of Apoxie® Sculpt on them. Cleaning metal tools is easy. Use either a coarse scrubby pad, or steel wool to polish them clean. I also use silicone rubber tools that you can buy in any art store. They clean up easily and don’t break down over time. They’re also impervious to the Aves® Safety Solvent, which is of course important to know. Aves® Safety Solvent is what I use to smooth out surfaces, and keep the material from sticking to my tools. One must note that they should be very careful when working with the Aves® Safety Solvent and Apoxie® Sculpt. Have a work area set aside specifically for your sculpting, avoid using the dining room table. If you value your furniture you will find a utility table to work on or cover your surface well. 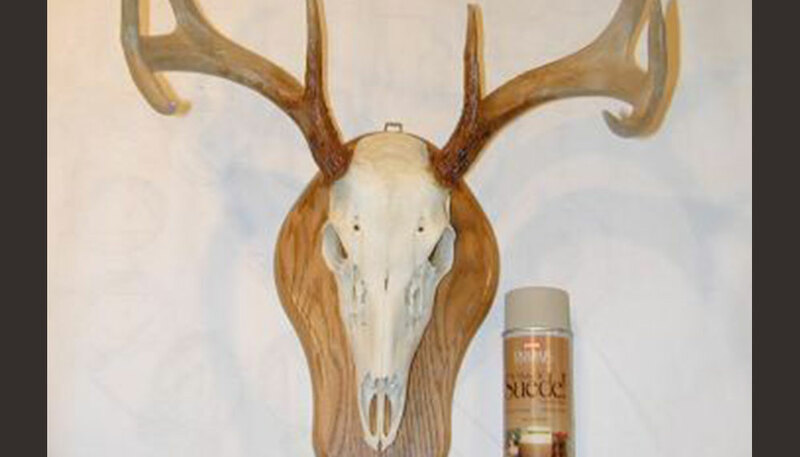 This entry was posted in Beginners Tips and tagged apoxie sculpt, beginner, clean up, Safety Solvent, Tools.